Drought ranks second in terms of national weather-related economic impacts, with annual losses nearing $9 billion per year in the U.S. Beyond direct economic impacts, drought can threaten drinking water supplies and ecosystems, and can even contribute to increased food prices. Within the last decade, drought conditions have hit the Southeastern US, the Midwest, and the Western US In 2011, Texas had the driest year since 1895. 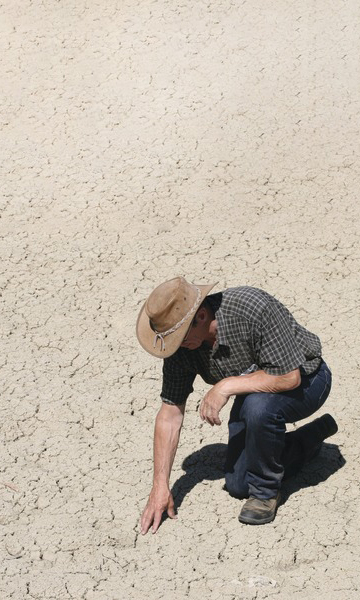 In 2013, California had the driest year on record. Drought can call to mind images of dry, cracked earth; low reservoir levels; and barren fields, yet these are actually examples of different types of drought, each of which is measured differently. We most often think about drought in relation to precipitation, assessing the degree of dryness (in comparison to a local or regional average) and the duration of the dry period. This is known as a meteorological drought, which is highly specific to a region as average precipitation may vary considerably spatially. We can also think about hydrological drought, or how decreased precipitation affects streamflow, soil moisture, reservoir and lake levels, and groundwater recharge. Farmers are most concerned with agricultural drought when available water supplies are not able to meet crop water demands. Agricultural droughts can occur for a variety of reasons, including low precipitation, the timing of water availability, or decreased access to water supplies. For instance, earlier snowmelt may not change the total quantity of water available but can lead to earlier runoff that is out of phase with peak water demand in the summer. Thus, it is possible to suffer an agricultural drought in the absence of a meteorological drought. The United States Drought Monitor has been producing weekly maps of drought conditions throughout the country since 1999. When considering the relationship of drought to climate change, it is important to make the distinction between weather and climate. Weather is a description of atmospheric conditions over a short period of time, while climate is how the atmosphere behaves over relatively long periods of time. Individual drought periods can be understood as discrete weather events. Climate changes occur over longer periods and can be observed as changes in the patterns of weather events. For instance, as temperatures have warmed over the past century, the prevalence and duration of drought has increased in the American West . Global climate change affects a variety of factors associated with drought. There is high confidence that increased temperatures will lead to more precipitation falling as rain rather than snow, earlier snow melt, and increased evaporation and transpiration. Thus the risk of hydrological and agricultural drought increases as temperatures rise. Much of the Mountain West has experienced declines in spring snowpack, especially since mid-century . These declines are related to a reduction in precipitation falling as snow (with more falling as rain), and a shift in timing of snowmelt. Earlier snowmelt, associated with warmer temperatures, can lead to water supply being increasingly out of phase with water demands. While there is some variability in the models for western North America as a whole, climate models unanimously project increased drought in the American Southwest. The Southwest is considered one of the more sensitive regions in the world for increased risk of drought caused by climate change . Current responses to drought tend to focus on short-term measures, such as temporary water conservation and efficiency improvements, water transfers, and increased use of groundwater. However, with increased drought risk, we must incorporate longer-term efforts that increase resilience to more frequent or severe drought conditions. Konstantinos and Leetenmaier. “Trends in 20th century drought over the continental United States.” Geophysical Research Letters, 33.10. (2006). Mote, Philip W. “Climate-Driven Variability and Trends in Mountain Snowpack in Western North America.” Journal of Climate, 19.23 (2006): 6209–6220. Sheffield, Justin, and Eric F. Wood. “Projected changes in drought occurrence under future global warming from multi-model, multi-scenario, IPCC AR4 simulations.” Climate Dynamics 31.1 (2008): 79–105. U.S. Global Change Research Program. Global Climate Change Impacts in the United States, Thomas R. Karl, Jerry M. Melillo, and Thomas C. Peterson (eds.). Cambridge University Press (2009). Are Severe Rain storms, Snow storms, Drought, and Tornadoes Linked to Global Warming?